The comparisons have to be made don’t they? At just £3.50 for the pale gold E.L.F Gotta Glow compared to £19.50 for NARS iconic Albatross highlighting powder… who isn’t hoping for a remarkable dupe? The NARS on the left.. E.L.F’s Gotta Glow, on the right. I’m not gonna talk about the differences in packaging. They’re there… NARS is annoying and icky sticky, E.L.F’s is sleeker but hella cheaper looking. Do you *really* care? I don’t. E.L.F’s Gotta Glow is slightly more yellow toned in appearance and the gold shimmer is less refined looking in the pan… chunkier. This is pretty much what I expected. On close inspection, you can see a visual difference in quality. The texture? Again… this lives up to expectations. NARS Albatross is smooth and very finely milled… there’s no flaking when you brush the surface of the pan and no fall out upon application. The E.L.F version can’t claim the same. It’s powdery and there is fall out if you don’t give your brush a tap off before applying. But how about this? Please look past the hairy arms… I have enough hair elsewhere on my body to frankly give a crap about hairy forearms. 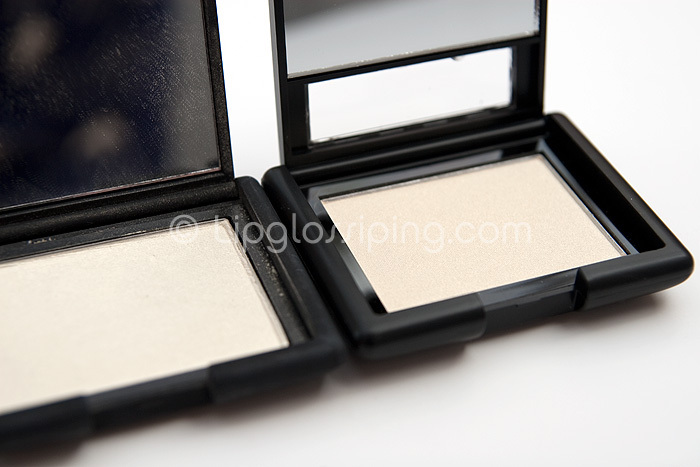 Oh ok… Well… E.L.F’s Gotta Glow is on the left and NARS Albatross is on the right. I think that I can tell the difference between the swatches… the E.L.F one looks slightly less pigmented and a bit ‘chunkier’. But is that *really* a £16 difference? Not when you take into consideration that once applied and blended… I truly struggle to tell the difference on my face at all. Before I get really excited though… there is one point to note that although not an issue for my skintone, may make ALL the difference on someone else. I see a slight ashiness with the E.L.F incarnation that I’m not seeing with the NARS original. 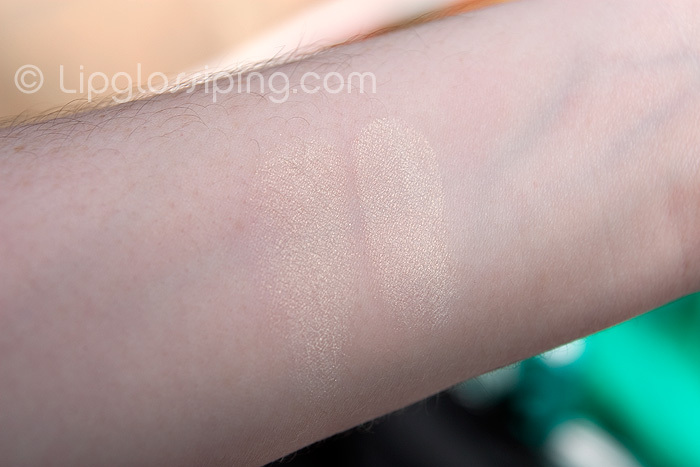 It’s only noticeable when I swatch on my fingertip… but I’m thinking that on a darker skintone, the E.L.F Gotta Glow may leave a slight white cast along with the golden sheen. Has anyone tried it with a darker skintone than mine? How are you finding E.L.F’s new Gotta Glow highlighting powder? E.L.F Gotta Glow is available online and priced at £3.50 – a bargain if ever I saw one. Thanks for this. Had been looking to buy this for ages but thought, why? Won’t it just make me all shimmery and glittery? For £3.50 I’ll take the plunge. Pretty simillar though and the slight difference isn’t worth £16 to me. Impressive!! Thanks for the swatches! I have the ELF version, unaware that it was a Nars dupe- I just wanted a nice highlighter for my super pale skin! I have yet to try it though, because frankly, I was a bit bummed at the gold tone (which, on my skin, looks gold, not highlighting.) I’d be intersted to hear how this looks on deep skin-I’ll try it myself as soon as I get the chance! I thought it was the opposite. gosh, the ELF one looks better to me. Wow! Surprisingly I got it right! I have been wanting to get the ELF powder for a while! I think I just might do it now. I could tell the differences in the swatches based on quality but I think once blended the elf would work really nicely. Especially as I don’t think I could justify spending that much on the NARS version. Love your blog, one of the highlights of my day! Wow, that’s impressive! Thanks for letting us know! But I’m fairly light so I don’t think I’ll splurge on the NARS. Great review as always, Charlotte! Maybe its time I finally put together my ELF order. I have wanted Albatross for a long time. I am concerned if it will do an ashy thing but but I am sure I can make it work somehow. yay i guessed correctly! thanks for the comparison!